I am defining a new relation in one of my new papers. I want to use the following symbol, because it conveys the meaning of my relation. Is there such a symbol in LaTex ? It is very similar to \leq and \preceq. If not, is there a way to add new symbols by hacking the back-end of LaTeX. Here's an attempt (better than the first one). It's a bit ugly, but it shows you how to do what you want (almost). 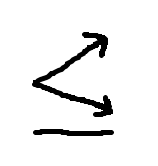 What is a simple way to create a binary relation symbol on top of another?